The last thing on your mind during those restful afternoons in Visalia is the dentist! 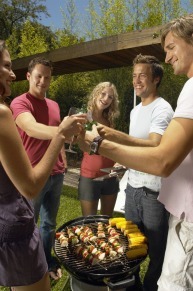 Summers in Visalia are a time for being outdoors, relaxing by the pool, and being with friends and family. Along with summer relaxation come the mouth-watering BBQ burgers and steaks, refreshing tropical drinks, and sweet treats. But does the thought of velvety ice cream, a glass of cold lemonade or juicy corn on the cob make your teeth ache? Many of us say that we have ‘sensitive teeth.’ We usually mean that sudden twinge of pain or discomfort when we eat certain foods. Having your dentist in Visalia target the reason why you have tooth sensitivity can make all the difference in eliminating this pain. Why not take advantage of some extra time off this summer and come and visit us at our dentist office in Visalia. Our dentist will take a look at your dental history and work with you to reduce and prevent tooth sensitivity. That way, you’ll be able to sit back, relax, and enjoy all the summer foods you love – without the pain!